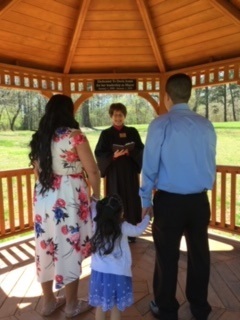 Spanish speaking officiant upon availability. To avoid no-shows, fee must be paid in advance. By money order or cash in person. one mile west of the 4-Way stop at the intersection of Hwy 108 and Hwy 140W. Please consider traffic when planning your travel. Call 770-479-2912 for further information. City Hall is small and the Council meeting room is used. Due to limited parking, please carpool. Friends and family are welcome to take pictures.